Three people have been charged with endangering the welfare of a minor in Greenville Tuesday morning after police responded to a call of an unattended child. Greenville Police Department say they received a call about a 4-year-old child walking alone at 10 a.m. in the Highland Drive area. After police located the child’s home, they found three adults with two other children. Police noted an order of marijuana inside the residence and located marijuana and drug paraphernalia in the home. 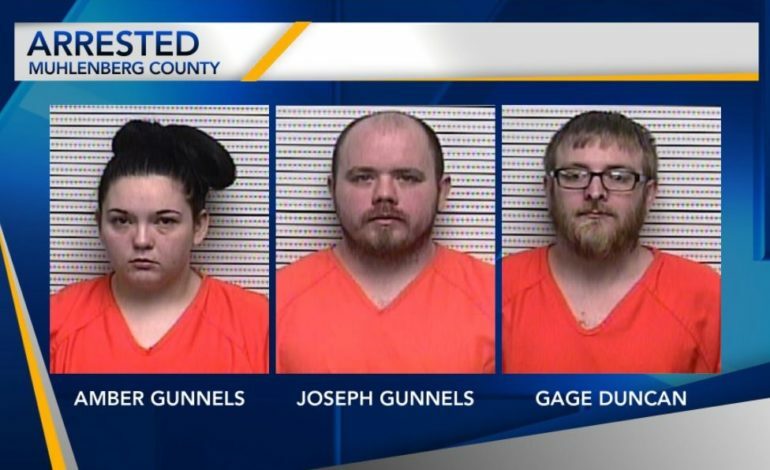 The father, 29-year-old Joseph Gunnels, the mother, 26-year-old Amber Gunnels, and 25-year-old Gage Duncan were all charged with endangering the welfare of a minor. Duncan was also charged with possession of marijuana and possession of drug paraphernalia. Joseph was also charged on an outstanding bench warrant while Amber was charged with possession of marijuana and possession of drug paraphernalia. A representative from the Cabinet for Health and Family Services assisted GPD. All three were lodged into the Muhlenberg County Jail.